Today is exactly one month before the release of my book baby, The Last Wish of Sasha Cade! It’s crazy to think that it’s almost out in the world. I originally wrote the book in June of 2016, got my agent in July of 2016, got my book deal around January 2017 and announced it April 1st, 2017. (only realizing it was April Fool’s Day a few minutes after announcing. Oops!) So now, 2 years and 4 months after writing the manuscript, Sasha, Raquel, and Elijah will be out in the world. I am so excited I could burst. To celebrate there being 30 days left until the release of my book, I thought I’d share 30 facts about the book with you today. 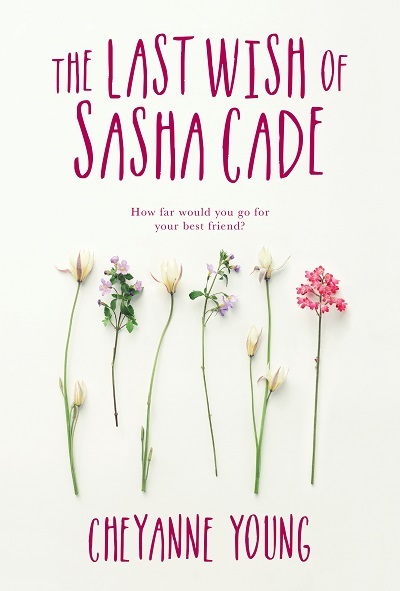 I originally titled the book SASHA CADE’S DEATHWISH. Why? Because I thought using the word Deathwish– a term that usually means you’re an idiot about to do something stupid– in the literal sense would be cool. And it did sound cool. But ultimately it sounds a little too much like a thriller, so we had to change it. I wrote the book in 30 days. No joke. The idea for the book came to me because I wanted to write about two loyal best friends who would never betray each other. But that was boring, so I decided one of them had to die. I queried 20 agents and received 3 offers of representation. After racking up 100 rejections over 3 failed manuscripts, this felt like nothing short of a miracle. After feeling really really bad for needing to reject 2 agents, I signed with Kim Lionetti, who is the very definition of a dream agent. I wrote the prologue on a scrap piece of paper when the idea for the book came to me. The real published version is nearly identical to my scribbled first draft. Award winning Canadian publisher KCP Loft bought my book. My editor is the lovely Kate Egan, who also edited The Hunger Games trilogy. The book is set in the town of Peyton Colony, Texas, which is an abandoned ghost town in real life. I like to resurrect ghost towns in my novels so that I can set the stories in “real” places, but they aren’t too real and I can make up the town’s layout as I see fit. Check out the one paragraph of information that’s left about the real Peyton Colony here. The original draft was 77,106 words. The published book is 81,482 words. I have a file of “cut scenes” from the manuscript which is over 10k words long. I chose Sasha’s name from the actress who plays Ali on Pretty Little Liars. I had been watching A LOT of that show back in 2016 and she was my favorite actress on the show. I named Raquel simply because I wanted Sasha to call her Rocki. Elijah got his name because I just really love the name. I thought of it in like 2 seconds and just went with it. I hid the number 336 in the book. I hide the number 336 in every book I write. Raquel’s mom has the same tattoo as my best friend. Sasha’s house is loosely based off a vacation home I once stayed in on Canyon Lake, Texas. Her house is a lot nicer, but the view is the same. The fictional band Zombie Radio is based off the real band, Alkaline Trio, that both me and my real BFF love. Chapter Twenty Five is my favorite chapter of the whole book. Yes, I cried while writing this book. I cried while editing it, too. Sasha’s favorite movies are also my favorite movies. Sasha didn’t originally have a dog. My editor suggested it, and I love the way it turned out. Sunny is now one of my favorite furry characters. I spent hours on Pinterest trying to find the cutest couples Halloween costume idea. I once fed deer off a balcony and thought it was the coolest thing ever. So I put it in the book. I’ve never written a prologue or epilogue in my life — and I don’t like them in books either, and yet somehow I felt compelled to write them for this book. They are my favorite parts of The Last Wish of Sasha Cade (besides Chapter 25). I cried when I saw the cover of the book. It’s stunning and simple and perfectly captures the feel of the novel. Want to read an excerpt? Click here!